The Canadian National Wheat, Barley, and Diverse Field Crop AgriScience Clusters were announced earlier today by the Honourable Laurence MacAulay, Minister of Agriculture and Agri-Food(AAFC). “WGRF is pleased to announce funding for 27 new research and technology transfer projects totaling more than $4.2 million dollars in these three Clusters focusing on wheat and barley variety development, specialty crops, agronomy, and knowledge transfer. Participation in each Cluster through the Canadian Agriculture Partnership Program enables WGRF to leverage producer dollars to help maximize on-farm profitability and sustainability,” says Terry Young, WGRF Board Chair. 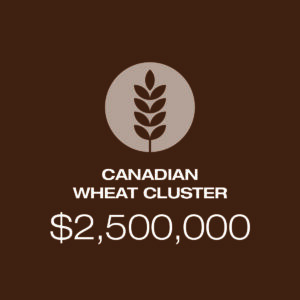 The Canadian National Wheat Cluster is led by the Canadian Wheat Research Coalition (CWRC). WGRF will invest nearly $2.5 million into 18 wheat projects ranging from the development of pre-breeding and breeding tools to improving yield, yield stability and grade protection, and management of Fusarium head blight. 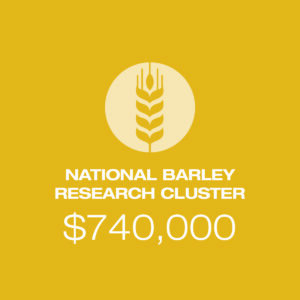 WGRF is investing $740,000 into the National Barley Research Cluster. The Barley Cluster is being led by the Barley Council of Canada. The Cluster will focus on projects that help maintain barley as a competitive crop choice for Canadian producers through improvements in agronomics, disease resistance and processing traits. WGRF will specifically support five projects focused on variety development, pathology and knowledge transfer. “There has been a very successful transition of wheat and barley varietal research funding leadership to the provincial commissions and associations. WGRF no longer receives check-off funds but we continue to invest the remaining check-off funds into wheat and barley variety development,” says Garth Patterson, WGRF Executive Director. 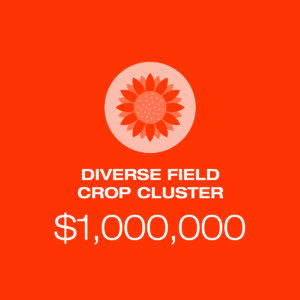 WGRF is also investing more than $1 million into the Diverse Field Crop Cluster (DFCC). Led by Ag-West Bio, this cluster is supporting a number of crops including flax, canaryseed, sunflower and mustard. The DFCC will align industry and research stakeholders to seize market opportunities and accelerate the acreage and returns of these high-potential crops in coming years. WGRF’s funding will specifically support four projects: the development of flax cultivars for Western Canada; germplasm and variety development of condiment mustard; storage and quality of canaryseed; and the development of confection sunflower hybrids.